Once you’ve chosen your social marketing platforms and learned about best practices in social media, what should you post other than blog posts and promotions? 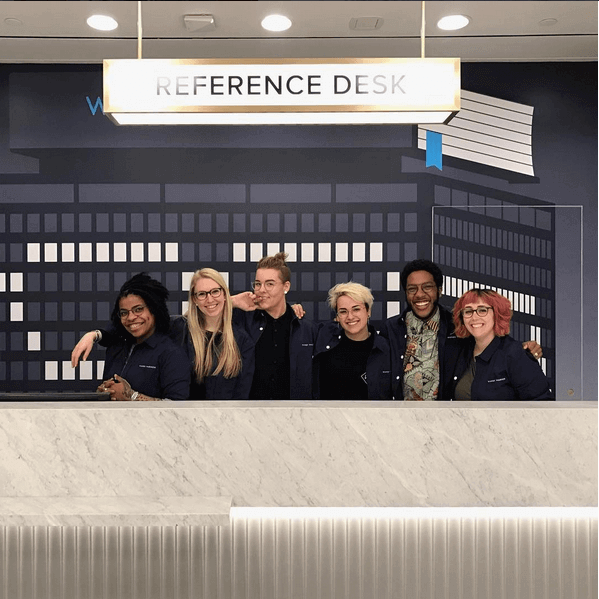 We’ve got some great tried-and-true tactics for you on how to best distribute content and create relationships via social media, so keep reading! All these content types have their place in a well-rounded social marketing strategy. But, what should each of these content types include? And, how do you apply it to your favorite social media platform? A quick note on Pinterest – Pinterest is very different to most social media platforms. In fact, it isn’t really a social platform at all. It’s a social bookmarking site and visual search engine and these content types don’t really apply. If you want to learn more about Pinterest, read our post on how to boost your blog traffic using the power of Pinterest. Connection content is intended to connect with your audience on a human level. People value authenticity from brands and mastering connection content will help you build a loyal fan following. But, what is connection content? Behind the scenes, either personal notes, images, or video. Real life stories and images. Sharing your favorite causes or groups and why these are dear to you. In a study, people cited shared values as the main reason for having a relationship with a brand. Sharing your fans and employees. How do you apply connection content to your favorite platform? Here are some ideas! Share a behind-the-scenes photo, real life story, favorite cause, fans, or employees in a post to your page or your own Facebook group. Get on Facebook Live and let people know about something happening in your life or give an update from an event you’re attending. Share a behind-the-scenes photo or video from an event, or from your workspace as you work. Create an Instagram Story of your day. Get on Instagram Live and share about your day. Share your support for a cause or an event. Share (regram) your fans wearing your products. Share an image of your employees. Share a tweet update. Compressing connection content into 140 characters may be a challenge! Share an image and add text to it to get around the tweet character limit. Share a link to a live Periscope broadcast about your day or an event you’re at. People like to interact on social media. In fact, 62% of millennials say they like it when brands engage with them in conversation on social media. Starting a conversation is good for your brand. Ending every piece of content with a conversation starter is great for encouraging engagement – no matter if it’s your blog post, your Instagram update, or your Facebook post. Post a question on your Facebook Page or in a group. Create a graphic for a fill-in-the-blanks post. 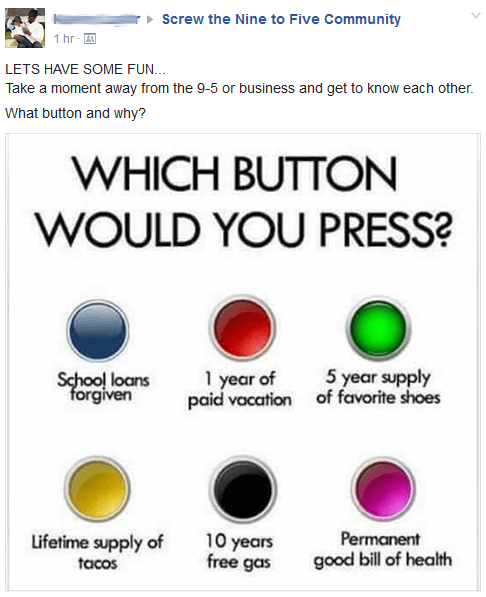 Create a graphic with your question or poll and ask people to leave comments in your caption. End your Instagram caption with a question or request for advice. Ask a question in your tweets. Create a graphic that asks your question or makes a statement, and ask if your followers agree in your tweet. Beyond just sharing a helpful blog post, you can also post content that teaches something. It might be a quick tip or a bite-sized nugget of wisdom, or even an answer to a FAQ that you get all the time. Education content is helpful to establish your reputation as an expert (and a generous one at that!) You can quickly become the go-to person in your niche if you regularly provide valuable educational posts. Provide one single tip. 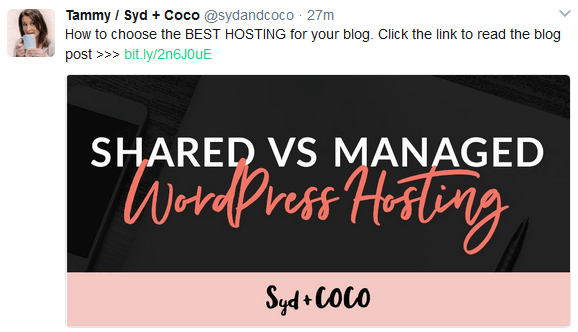 For example, if you’re a copywriter, you might post a tip on how to present discounted pricing, whether in whole dollar amounts or in percentages. Share your recent discovery of a new feature of a tool you use. Share a before-and-after tip showing how you got results implementing a tweak to your social media strategy. Share text, image, or videos on your page and in groups. Make a short tutorial video showing your audience how to do something technical or use a new tool. Share a short tutorial video (especially good for DIY, food, and fitness niches). If you’ve got a lot of text, include most of it on a graphic. Summarize it with your tweet. Make people laugh and enjoy your content and they’ll come back for more. In a survey by MarketingSherpa, 31% of people said that they followed brands for entertaining content. What kind of content can you use to entertain your audience? Interactive entertainment like quizzes and polls. Funny memes, images, videos, GIFS. Post fun activities in groups. For example, “Finish this sentence using your phone’s autosuggest,” or, “Tell us about your business using emojis”. Run a survey asking people to respond with different Reactions for the category they fall into. Inspirational content gets people motivated to take action. They’re often found on social media in the form of quote graphics where the quote text overlays a photo. You might also want to include case studies and results that get people pumped. For example, you could post before-and-after images (perfect if you’re in the weight loss, DIY, renovations, or fashion niches). Share a personal story that is inspirational. Share a personal story with before and after images. Quote graphics are very popular. 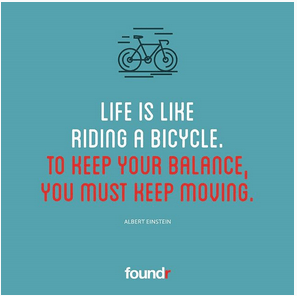 For example, Foundr has 1 million Instagram followers and posts almost exclusively quote graphics. Post short results and testimonials. Promotion content includes any kind of content that promotes your business, your brand, or your website. It might include giveaways you’re running, blog posts, freebies, paid products, services, webinars or events, discounts, and more. What kind of content should you use for your promotions? Promote your best content and deals. Images are more memorable than text, so creating graphics for your promotions is a great idea. Use video or Facebook Live. Facebook Live is prioritized in the Facebook feed while it’s live. Also, engagement is better with live video, with 3x more people watching live videos than non-live videos. 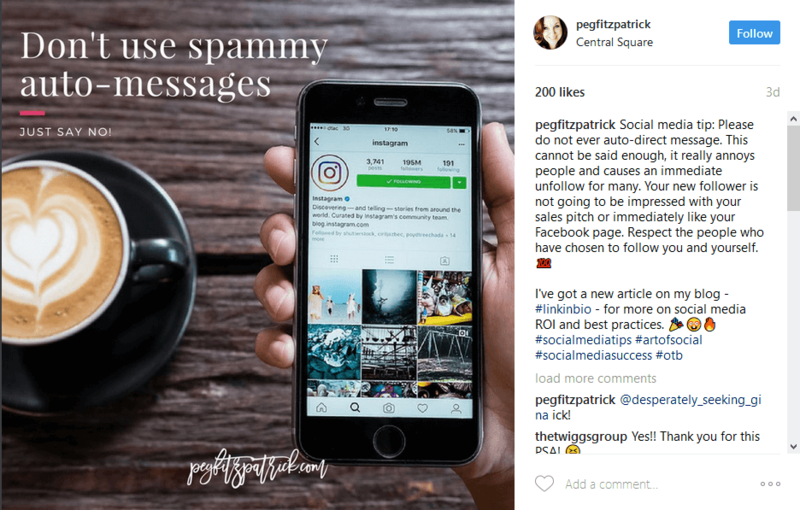 Instagram can be a little tricky to promote on because links in the captions are not live. You can add a live link to your latest promotion to your bio and let your audience know that the “Link is in bio” in your caption. Create a graphic to advertise your latest promotion or blog post. Use hashtags to extend your reach and engagement. Using one or two hashtags can double your engagement. Use images to increase engagement. Using an image can increase engagement by 313%. 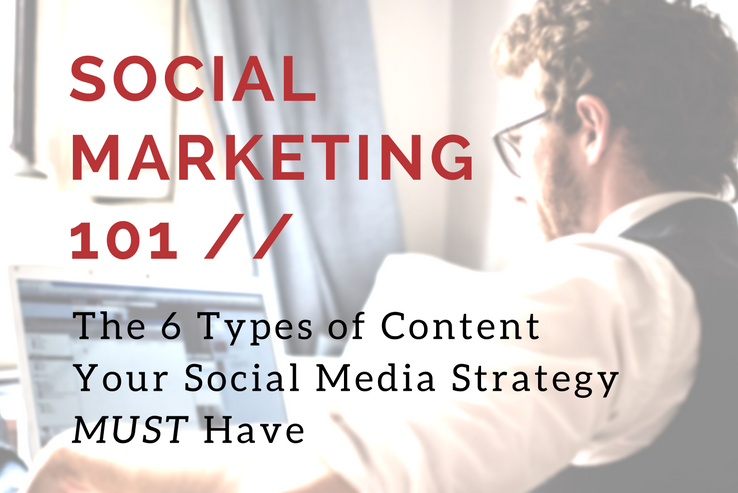 There are six types of content you can post on social media for a well-rounded approach. Are you making use of all of them? Connection content humanizes your brand, while conversation content helps you form deeper relationships with your audience. Posting education content shares your knowledge and helps you get known for being an expert in your niche. Entertainment content keeps your followers engaged and enjoying your content, while Inspiration content gets them pumped about taking action. Finally, Promotion content is when you share your own offerings to your fans. Over to you – are you missing any types of content from your repertoire? Let us know in the comments below what types of content you normally post and what you’re going to do in future. If you liked this post, be sure to catch our other articles in the series: Social Marketing 101: Part 1 – Where to Build Your Presence and Social Marketing 101: Part 2 – Following Best Practices.